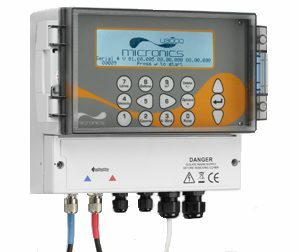 Utilizing advanced DSP technology, the Portaflow portable ultrasonic clamp on flow meter is the latest portable flow measurement recording system to be added to the Micronics range of equipment. 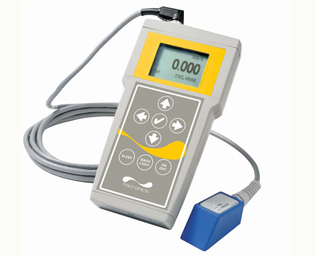 The Portaflow portable ultrasonic clamp on flow meter can display instantaneous fluid flow rates or velocity, together with bidirectional totalized values. 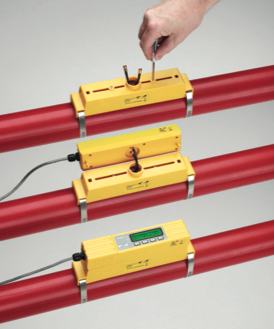 A variable current or pulse output, proportional to the detected flow rate, is also produced by the Portaflow portable ultrasonic clamp on flow meter to enable it to interface with a range of external control devices such as those found in building management or site monitoring systems. The Portaflow portable ultrasonic clamp on flow meter is very much designed with ‘ease of use’ in mind. An interactive Quick Start menu, which simplifies system installation at any suitable location, together with minimal set-up requirements, means that the system can be installed and brought into service very quickly. Furthermore, the application parameters for a particular site can be saved to nonvolatile memory and instantly recalled if a site is revisited for monitoring at a later time – further reducing the set-up time. The flow sensors, i.e. 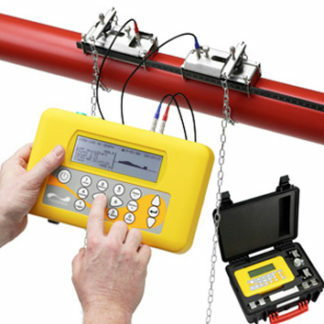 transducers, connected to the Portaflow portable ultrasonic clamp on flow meter are attached to the outside of the pipe being monitored and provide totally non-invasive flow measurement without disturbing the existing plant equipment or process operation.